When I was working, getting up at 7:30 would have been an infrequently enjoyed luxury. Now that I am retired, getting up at 7:30 is a chore. I usually sleep in until 9:30 or later. However, yesterday we needed to be fed, showered and dressed so that we could meet Zahava and Klaus at the Ángel Guimerá metro stop at 9:00. The metro for Liria was scheduled to leave at 9:13 and the trip takes forty-five minutes. That would give us an hour to walk the two plus miles from the metro station to the town of Benisanó, which is where the restaurant Levante is located. The Vidal family opened the then Bar Levante in 1968. It was your typical roadside bar that offered rather traditional tapas, bocadillos, and other assorted goodies. Day laborers would come by at 9:30 for their morning break, return in the afternoon after their workday ended and also to see if there was work available for them the following day. People would stop by for coffee after lunch and on warm evenings would stop in for an aperitivo. All that would change one Sunday in 1971. On any given Sunday back then just about every family would have paella for lunch. On this particular Sunday a couple entered the bar. They were in town looking to rent a place for the summer and come lunchtime they were looking for a place to eat. There best bet was to find a bar that was open and see if they could get a sandwich or two to tide them over. Rafael’s mother had just placed the paella on the family table when the couple walked in. Their intent was to ask for a sandwich, but when they saw and smelled the paella they asked if perhaps they could have some for their lunch. They returned the following Sunday for paella, but this time they had called during the week to ask if it would be possible. Word of mouth began to spread and the people in the neighboring towns learned that there was a bar nearby that served great paella. The transition from bar to restaurant had begun and there was a consistent need to expand the dining area. In 1987 the space was totally renovated. The restaurant was and still is family owned and operated and the team that is responsible for the day to day operation consists of Rafael, his wife, his two sons, his sister, his brother-in-law and his nephews. There are several events that have served to help spread the reputation of the restaurant and its head chef worldwide. In 1976 they were invited to prepare paella at a luncheon in honor of the King and Queen of Spain who were visiting Valencia to introduce themselves to their new subjects. The restaurant that was hosting the event, Barrachina, would not allow the Vidals to enter the dining room to present their masterpiece nor did they mention that the Vidals were responsible for the excellent paella. The good news is that, a few days later, there was a reception for the royal couple attended by all the mayors of the surrounding cities and towns in Valencia and Rafael’s mother and father had been given an invitation as compensation for the episode in the restaurant. Everyone had been given strict orders not to engage the King and Queen in conversation because the guest list was enormous. The instructions were shake hands, bow and move on. Rafael’s parents, however, strictly disobeying orders, shook hands with the King and told him that they were the ones who had prepared the paella at Barrachina. In 1990 when the King and Queen were spending their summer in Mallorca, Rafael was invited to come and prepare paella for them. In 2006 Rafael was invited by José Andrés to make paella for some 1500 attendees at the 9th annual Tastes of the World Convention where the focus was the food of Spain. The event was held in Napa and almost every famous Spanish chef was in attendance including Ferrán Adriá. Rafael continues to work with Andrés and as he opens new restaurants he flies Rafael in to teach his chefs how to make an authentic paella valenciana. Rafael has succeeded in defining what is an authentic paella valenciana angry at what was being passed off as the authentic version in other parts of Spain and the world. On his days off he and his wife would travel all over the Valencian Community and would ask people how they made paella. 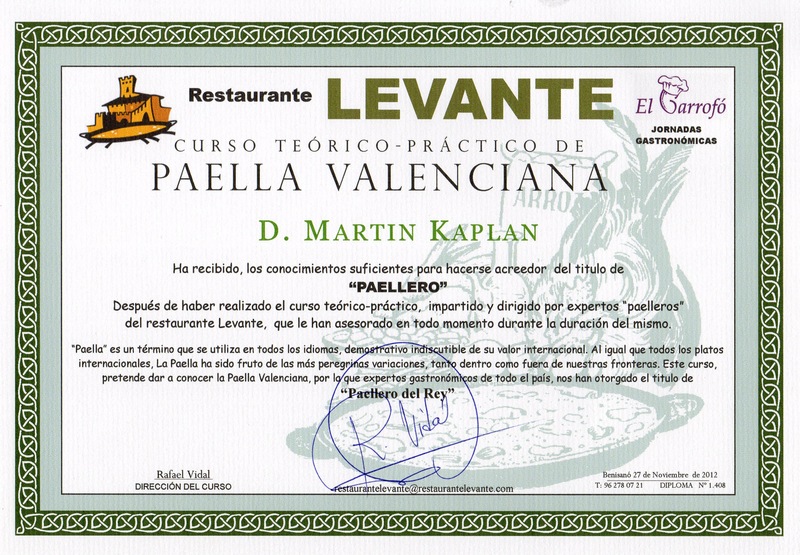 When that task was over, he looked at all his data and concluded that an authentic paella valenciana. The ingredients are ten in number and they are: chicken, rabbit, olive oil, ripe chopped tomatoes, wide green beans, large white lima beans, Valencian rice, water, and saffron. Salt is added toward the end of the cooking process. The walk to the metro station took less time than we anticipated and we were the first to arrive. While we were fiddling with the ticket machine Klaus and Zahava arrived and went down to the platform. When we made it down to the platform we discovered that another couple would be joining us, Ana and Marc Boyer. Ana is from Valencia and Marc is from Northern Ontario. They both teach at the American School of Valencia. We got to Liria at 10:00 and we stopped in at a nearby café for a cup of coffee. We then made our way to the restaurant and got there a few minutes before 11:00. Rafael greeted us and invited us down to the bodega where, in addition to an incredible selection of wines, there is a table for twelve reserved for special groups only. We waited for ten minutes for other attendees to arrive, but when nobody else appeared, we began. Rafael told us about the history of the restaurant and his search for the perfect paella recipe. As he finished his part of the presentation another participant arrived, Julio Casillas. Since today’s class marked the first time in the history of this class that something other than a paella valenciana was to be prepared, Rafael’s son, Victor, then joined us to explain how to prepare an arroz a banda. Arroz a banda is traditionally prepared with a seafood stock and includes both fish and shellfish. With this dish the focus is the rice and the quality of the stock that is absorbed by the rice. Traditionally the rice is first served by itself so as to appreciate the quality of the preparation. Then the seafood is served apart from the rice. A banda is valenciano for apart. The lecture portion of the course having concluded, we headed upstairs to watch the preparation of our lunch. However, we needed to put on our aprons and our toques before we headed up to the second floor. The second kitchen is located on the second floor and it features a firewood paellera that is some forty-five feet long and where as many as eight paellas can be prepared simultaneously. Olive wood and orange wood are the best choices for the fire because of their density. We watched and listened as the ingredients were added and we were told how to determine the optimum moment for adding the next ingredient. At one point in his presentation, Rafael stopped to ask us what the most important ingredient was at this point in the process. Everyone ventured a guess, but Rafael told us that none of us had guessed that the most important ingredient as this point were the cold beers that were about to be served. Out came the beer, followed by a parade of tapas that included a croqueta of aged cheese and one of tuna. There was also a tosta covered with a bean spread, as well as a taste of esgarraet. Properly nourished we watched the final steps of the preparation and when both were cooked to perfection we headed downstairs to where our table was waiting. We had the arroz a banda first and it was indeed exceptional. 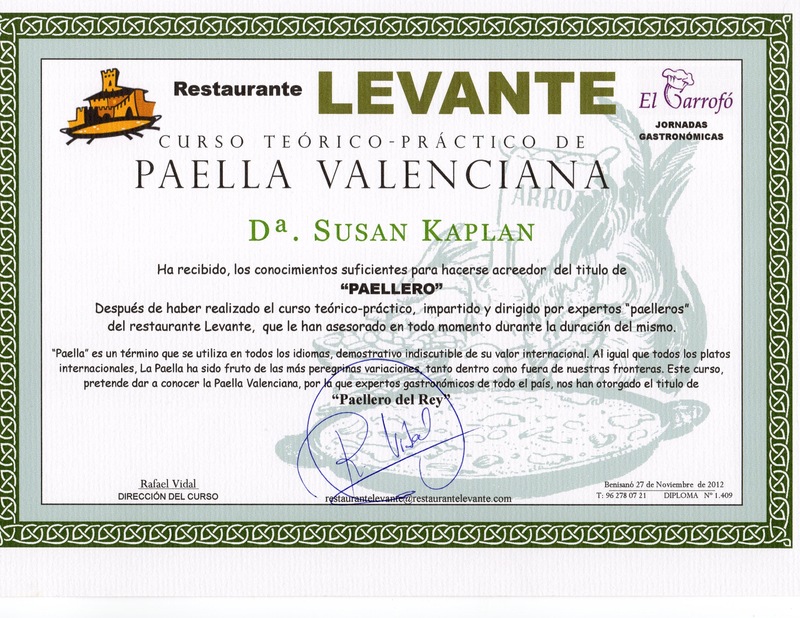 Next came the paella valenciana, which was one of the best that we have ever tasted. White wine was served with the arroz and a red was served with the paella. Next came an array of desserts all of which are made in the restaurant by Rafael’s wife. Klaus insisted that we had to taste the fig ice cream and the waitress quickly attended to our request. The ice cream had an intense fig flavor. It was just like eating a cold fig. We ended the meal with coffee. Graduation followed our meal. We were each presented with a diploma and a wallet-sizes ID that attested to the fact that we were graduates of the course. In addition to the toque and the apron we also received a bottle of wine, a sizeable quantity of the rice they use in their paellas and some dried beans they grow on their property. We also got a copy of the recipe. We left the restaurant with both our belly full and our arms filled. What a great experience. We walked back to the metro station and waited a half hour for the next metro back to Valencia. We all got off the train at the same stop, but we then went our separate ways. When we got home, we were in for the rest of the day and we did a little bit of this and that before we went to bed around 11:30.